You will have loads of fun and relaxation in this Puma 29-QBSS travel trailer. Imagine the kids playing outside all day then retiring to their very own private bunkhouse. 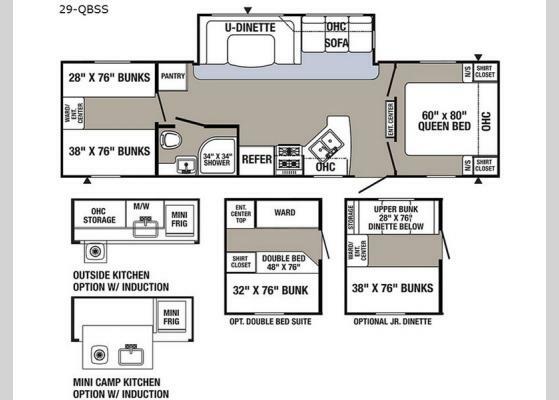 Then imagine yourself sleeping in the private front bedroom after playing games on the u-shaped dinette. 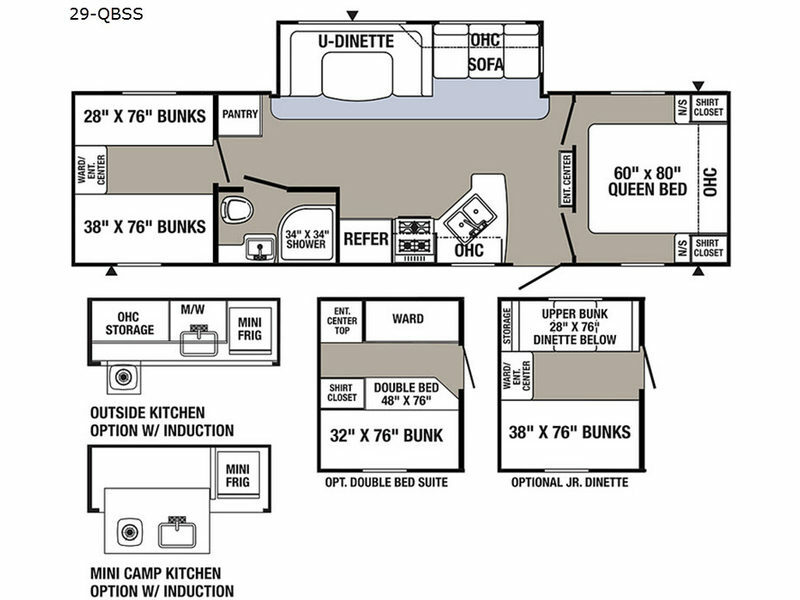 This trailer also has a few options if you prefer a different bunkhouse layout. There is storage throughout the inside as well as outside in the pass-through compartment. You have the choice of adding an outside kitchen or mini camp kitchen option, both with an induction cook-top if you wish, and more! Load up the family and start having fun in the great outdoors with comforts of home inside! If you love an adventure, and enjoy the outdoors, the rugged built Palomino Puma travel trailers and fifth wheels are a great choice for making your next adventure fun and trouble free! Puma is offered in a large variety of sizes and floorplan layouts with plenty of bunk models for the kids. Many are also 1/2 ton towable so you can easily hook-up and head out for a great time away from home. Both travel trailer and fifth wheels offer an Evergreen high density foam mattress, carefree Beauflor flooring, LED lighting, and they are pre-wired for a solar system just in case you wish to go off-grid for a time. And, the Puma rubber roof has a 12 year manufacturer warranty! Now how's that for peace of mind! Come make your choice today and begin enjoying the change of scenery as you pick your next place to spend adventuring!